... That would be Southwest United States to Southeast France. In this case, New Mexico to Provence, to be exact. This might sound like an odd combination of places to lump together, as they seem so different at first glance. But, when you look closely, the similarities begin to emerge quickly. Both New Mexico and Provence are known for their natural beauty, clean air and sense of place. Each is renowned for its art and architecture and, amazingly enough, they both like to trim their homes with intense and luxurious hues of azure blue. Life onstage plays a large part for each region, too; the Santa Fe Opera is one of the most incredible aural and visual experiences I have ever had, and in Orange, the Roman Theatre has a series of theatrical and operatic performances in its summer season. 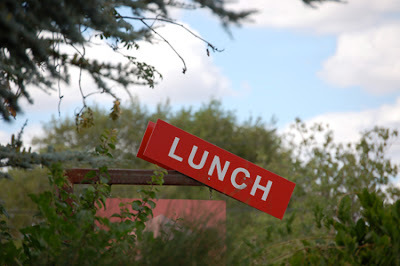 And the cuisine, while night and day in terms of ingredients used, is very local, fresh and exquisite in both places. Mark and I just spent my 52nd birthday in Santa Fe, New Mexico (thanks for the cake, Doreen!). There was no trauma about aging - I lost most of my hair eons ago and the reading glasses arrived on my nose at 42, so there is little left to fret as I get older. My only goal is to enjoy as time marches on! (Enjoy equals eat, by the way.) We had many wonderful meals in those five days in Santa Fe, including our breakfasts at the Bed and Breakfast where we stayed, just three blocks west of the Plaza. One of the most memorable meals was at a restaurant by the name of Ristra. Ristra is the Spanish word for string and is used here in the U.S. Southwest for strings of chiles that are strung up to dry in the desert heat. We chose the restaurant because of its inviting covered patio, its Southwest name and its elegant ristra logo. 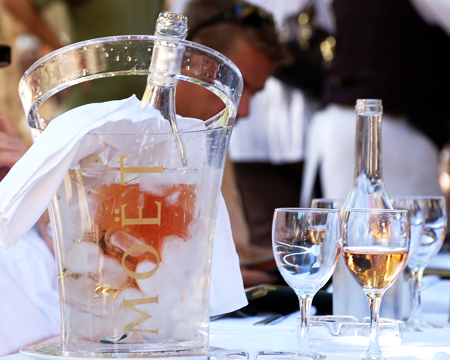 We never looked at a menu; we simply requested a table on the patio and sat ourselves down. 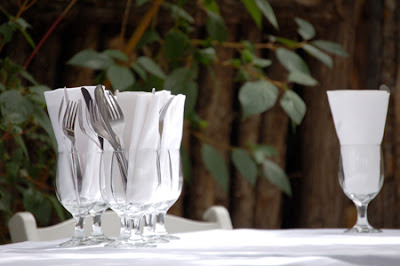 We were handed menus and were surprised and delighted to find that the cuisine was primarily French but with New Mexican flavors – the overall effect (to us) was Provençal. We both started our meals by toasting with a kir. I had never before realized that the color was so similar to that of a fine rosé - so much so that the wife of the couple one table over looked and said, "Oh, let's have rosé, too!" We had considered rosé when we perused the wine list, but then saw kirs listed at the top of the menu among the apéritifs and chose them, fondly recalling our first visit to Paris together. We each chose a sandwich served on house-made fougasse (the Provençal version of focaccia). I opted for the pain bagnat which featured a beautifully seared tuna filet with hard-cooked eggs, black Moroccan olives, red bell peppers and a citrus mayonnaise. Mark chose the curried lobster sandwich. Both meals were served with a generous spinach salad dressed lightly with a vinaigrette. Honestly, we were so enchanted by the ambiance, the aromas, the flavors and our second kirs that I completely forgot to photograph the meals! I did, however, remember to photograph dessert. 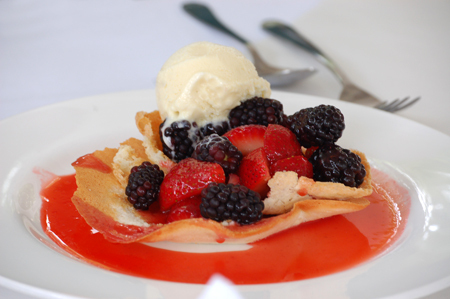 We took our server Lauren's advice and ordered the lemon-almond tuile with mixed berries and vanilla ice cream. And, trying to behave a little so that we could fit back into the car to return to Tucson, we shared one portion. It was the perfect ending to a perfect meal - the venue, the food, the presentation, the leisurely pace and the fine service. Naturally, while eating, we discussed more food. I was telling Mark about the new blog our friends Susan and Towny are writing about all things Provençal - The Modern Trobadors - and how they had just posted an essay on pastis. 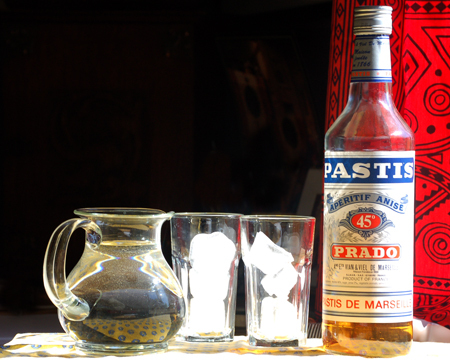 I put a comment on their blog that I am not a huge fan of pastis unless I am sitting in a square in Provence on a hot August afternoon. I added that one of my favorite recipes is a fennel-tomato soup laced with pastis. Susan requested I share that recipe with their readers and now, via Cocoa and Lavender, I happily do so. 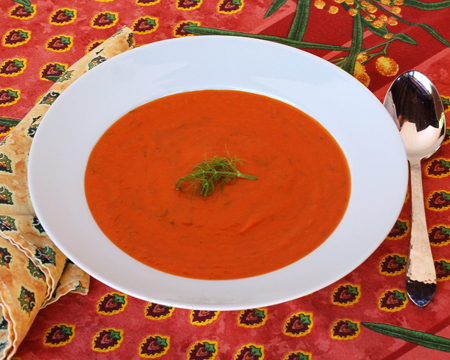 In the end, it is a nice Labor Day soup to serve, as fennel is just coming into the markets here. And, if I add a soupçon of the chile powder that we bought in Chimayo, New Mexico, we can pretend we are simultaneously in two of our favorite places - the Southwest and the Southeast! Melt the butter in a 3-quart saucepan over medium heat. Add the chopped fennel and onion and cook over medium-low heat until vegetables are soft - about 20 minutes. Add salt, piment d'Esplette, and pepper, and cook one minute more. Add the tomatoes and all the juices form the can, stir well and bring to a boil. Reduce heat and cook a simmer, uncovered, for 30 minutes. Set aside to let cool slightly. Purée the soup in two batches in a blender, adding 1/2 cup of the vegetable stock to each batch. Put the soup through the finest disk of a food mill into a clean pan and add the pastis, stirring to blend. Thoroughly wash the feathery fennel fronds and reserve 8 small stems for garnish, if desired. Chop remaining fronds and stir in 1/4 cup (packed) to the soup. Bring to a simmer and serve. Makes 8 one-half cup servings. What a wonderful post....I felt like I was at the table on the patio at Ristra with you both, enjoying a kir or two, myself. 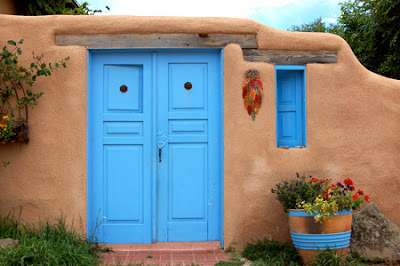 I was intrigued in all the similarities between New Mexico and Provence, too, and was particularly struck by the common passion for the vibrant blue accents on their homes. You might be interested to know that in Burkina Faso, the third poorest country in the world and, according to a recent Newsweek, the worst place in the world to live, bright blue accents can also be found on select homes. (Our daughter, as you know, was just in Burkina and returned with wonderful photographs and stories.) While not the norm in Burkina--one is lucky to have a home made of stable walls, let alone one that is brightened by such a pretty color--isn't that curious? Finally, THAT soup sounds divine. I can't wait to make it! Thanks so much. In Mexico, we are told the blue helps to ward off evil. Maybe it is an international concept! So glad you enjoyed a kit with us! Let me know when you try the soup. That blue door... it reminds me of Myconos and all the Aegean Greek islands. It sounds like you guys had the most terrific time (and meals) in Santa Fe. That dessert looks amazing! So does your soup. Great combination of flavors. Happy birthday again David! Wish you all the best and many more trips to wonderful places! What a treat finding your blog was! You seem to enjoy meals the same as I do - the eating but first the photographing of them! I too have got so excited to eat that I have forgot - until it is too late - to take the photo...Heading for Susan and Towny's place in November, my TX friend and I will certainly try out your soup recipe. Magda, is the blue in Greece chosen for any reason other than its beauty? I dream of my future visit to Myconos! Linda, thanks for your note! You are going to love their place in Lourmarin! Let me know how you like the soup! Houses on the islands of Kyklades (an island group in the Aegean Sea) are always painted white and have blue doors and windows. The white deflects light so the houses stay warm during hot summer days (and those can be quite hot in Greece). I don't know why they paint the doors blue. I suppose to match the magnificent blue of the Aegean sea. You've been to Myconos? Did you like it? I hope you get to visit the island again soon! Oh and something else! You mentioned on a comment at my blog about a cookbook project? Do tell more! I want to let everyone know (belatedly) that we made this soup TWICE: once for my husband and me and again, at my brother's request when, after arriving here well after midnight from California, he had only a tiny taste (all that was left) and demanded (politely) that we make it again! We did, with pleasure! You are quite the extraordinary food artist! I cannot wait to get my signed copy of the cookbook!